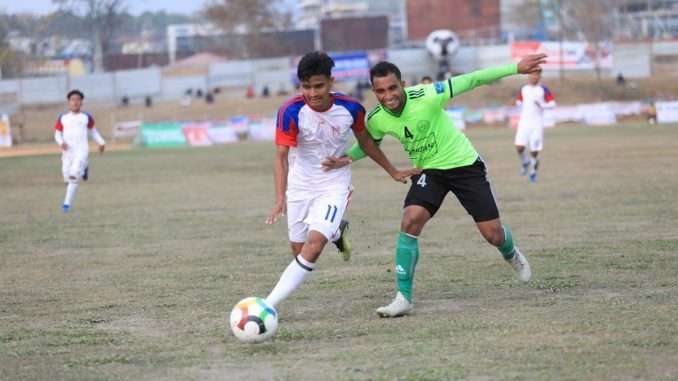 Pokhara–League champion Manang Marshyangdi Club advanced the semi final of 6th Manakamana Cable Car Pokhara Cup Football Tournament on Wednesday. MMC beat brigade Boys 5-4 in tie breaker as regular 90 minute and added extra time stuck in 1-1. Brigade Boys’ Padam Bhattrai’s shot was catched by MMC goalkeeper and man of the match Bishal shrestha in tie breaker. MMC’s Suraj BK, Skipper Sujal Shrestha, Hemanta Gurung, Kamal Shrestha and Prakash Budhathoki also scored in tie breaker. Similarly, Randip Paudel, Suraj Thakuri, Jay Gurung and Manoj Rai remained successful in scoring in tie breaker for BB. Earlier, Ritik Khadka scored in 15 minute for Brigade Boys but MMC took 67 minute to level the score. Brigade Boys confined in 10 players as goalkeeper Lucky Karki saw red card in 88th minute as he held ball outside the D area. APF Club will take on japanese Club on Thursday in first semi final match.